Orlando Lady Developers has announced an upcoming 'Make Day', an exciting two-part workshop in which coders and creators will develop their abilities in design, ideation and product development while contributing to solutions that help women achieve their goals in the software and technology industry. The situation is challenging; by 2020 there will be 1.4 million available jobs in computing-related fields, but the United States is on pace to fill only 29 percent of them with computer science graduates. Countless studies have shown the importance and benefits to approaching problems with diverse teams, yet at current rates only 3 percent of these jobs will be filled by women. The Make Day event will work to remedy these circumstances by bringing together members of Orlando’s tech community to explore how we might help to encourage women and girls to pursue greater opportunities with more confidence in Orlando’s vibrant and growing tech community. “Through our dialogs and interviews with women, they said they want to work together on problems meaningful to them and co-create software solutions that impact our lives. MakeDay does just this and is designed to ensure that everyone’s voice is heard and their talents are utilized. This innovative program demonstrates a new way of energizing women and girls around technology,” says Leslie Hielema, co-founder of Girls Who Code Orlando. In the first workshop, the Ideation session, participants will practice innovative techniques in design and idea generation that help creative teams in finding solutions to difficult problems. This session will be lead by Erin Denton, Freelance Designer and Co-Captain of Code for Orlando, and Stacey Baldini, Freelance Designer and Instructor at Skillcrush. “Orlando’s Girls Who Code Clubs this past summer was the first time we got to see what it looks like when you bring a bunch of females together to build technical solutions to challenging problems. 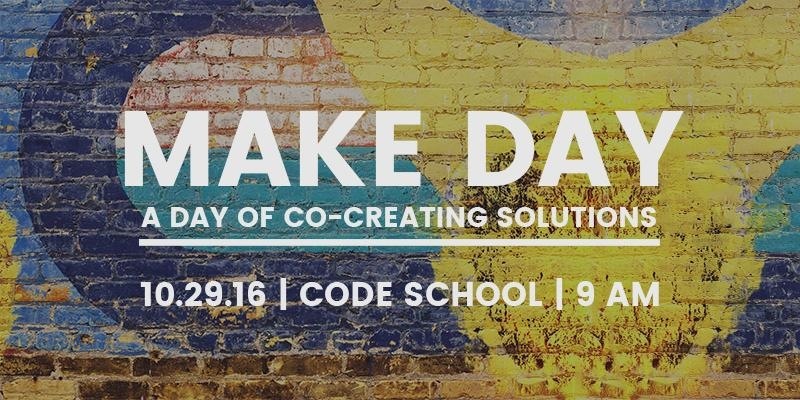 We want to build upon that success with Make Day, an event that is geared towards the empowerment of not only girls, but women in technical fields within our community,” adds Cassandra Wilcox, Girls Who Code Orlando Lead Instructor. Code School and Code Hangar Inc. are thrilled to join Orlando Lady Developers in sponsoring this event. The goal of Orlando Lady Developers is to make the world a better place by increasing the influence that women have in building technologies that affect our culture, through recognition, connection, and mentorship.